Part One can be read here. Part Two can be read here. It had been a hectic morning on June 27, 1863. Under the cover of darkness, rebel privateers under the command of Charles Read first jumped aboard the Caleb Cushing, a revenue cutter tied-up port within Portland, Maine. Read’s men captured the small crew aboard the cutter and then started to make their way out of the harbor, but were stalled due to small winds that barely caught the Caleb Cushing’s sails. At first light, discovering that the cutter had been captured, Portland’s fortresses and garrisons were abuzz, and about an hour after first learning of the Caleb Cushing’s capture, a small armada of ships steamed after Read’s prize. By the time that the Federal ships caught up to Read, the Confederates had managed to only get about 15 miles out of the harbor. Seeing the oncoming Federals, Read decided to fight it out. Except the Georgian-born Lieutenant Dudley Davenport, in temporary command of the Caleb Cushing at the time of its capture, was not cooperating. Aboard the Caleb Cushing Read’s men found enough shot and powder for about ten discharges from the large 32-pounder. This would not be nearly enough to fight off the oncoming vessels, but Davenport steadfastly refused to give up the location of the keys that would open the Caleb Cushing’s powder magazine. Deep in the hold of the Caleb Cushing were almost ninety rounds of solid and case shot with accompanying powder stores and yet, for all he threatened and roared, Read was not able to coerce Davenport into giving up the keys. Prime also had to reckon with the skittish civilian pilot of the Forest City. As more shots rang out from the Caleb Cushing, the rounds bounced along the water like skipping stones. Though none of the shells struck, the Forest City was completely unarmored; a single round into one of its paddle wheels would be catastrophic. With little recourse, the Forest City hung back, waiting for the Chesapeake, which was speedily chugging up to the scene. While the Chesapeake was armed similarly to the Forest City in terms of cannon, it at least had some semblance of protection. Earlier in the morning, as the 7th Maine and citizens piled aboard, someone had had the frame of mind to throw against the sides of the Chesapeake about “50 bales of cotton for barricades.” Though not much, the cotton bales were better than the entirely unprotected Forest City. While Read fired more shots from the 32-pounder, still not hitting anything, the Chesapeake and Forest City pulled up alongside each other. Now only about a mile separated the two Federal ships from the Caleb Cushing, which was quickly running out of shots because of Davenport’s tenacious refusals to Read’s demands. Picking up steam, the Chesapeake made its way towards the Caleb Cushing¸ evidently with the intent of ramming the captured cutter. As the Chesapeake rushed ahead, Charles Read knew he was running out of options. The 32-pounder fired one last time, scattering a load of grapeshot across the water in what was entirely a final symbol of resistance. With his largest asset now useless, Read gathered the Caleb Cushing’s captured crew on deck and herded them and his prize crew into small rowboats. Before abandoning the cutter, though, a slow match was set on fire and the flames began to crackle around the ship. The “Caleb Cushing” burns in a print from the July 11, 1863 edition of “Harper’s Weekly”. The “Caleb Cushing” exploded around 2 PM on June 27, 1863. 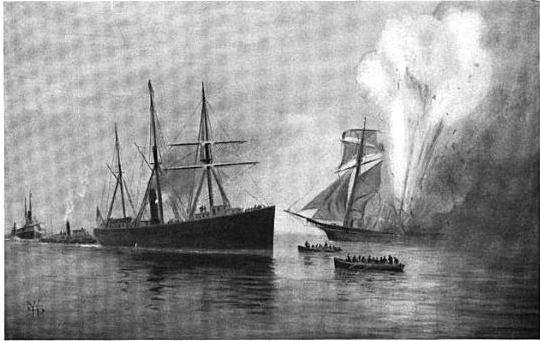 The explosion of the Caleb Cushing and its rapid sinking proved to be the climatic finish to the Battle of Portland Harbor. The Archer, Read’s captured prize that he had sailed into Portland Harbor the day before, was nearby and trying to slink away but the Forest City quickly caught up and, with one shot fired across its bow, convinced the smaller ship to surrender. 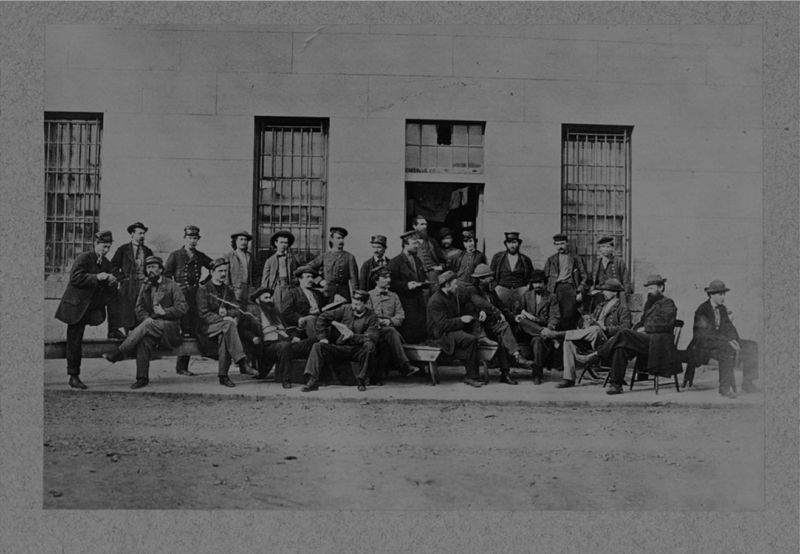 The Federals returned to Portland and Read with his men were temporarily imprisoned in Fort Preble, the headquarters for the 17th United States Infantry. Read did not say in Portland for long, however. Major George Andrews, commanding the Regulars at Fort Preble, wrote to his superiors, suggesting that the rebels be moved away from the harbor because of the “present excitement.” Andrews elaborated, “I would respectfully suggest that the prisoners be sent from here as quietly and expeditiously as possible, as I do not think it safe here for them to be placed in the custody of the citizens….” Agreeing with Andrews, higher commands arranged for Read and his rebels to be moved to Fort Warren in Boston Harbor a short while later. Confederate prisoners at Ft. Warren. Charles Read is sixth from right. Almost as quickly as it had begun, the Battle of Portland Harbor was over. Read’s adventure, from leaving the CSS Florida off the coast of Brazil to his capture off the coast of Maine, lasted 52 days. He captured or destroyed close to twenty ships, including in a grand finale, the Caleb Cushing. Read would remain as a prisoner at Fort Warren until being exchanged in September, 1864. The Civil War had come to the coast of Maine, and, then, in the blink of an eye, was gone again. Official Records of the Union and Confederate Navies in the War of the Rebellion,Ser. 1, Vol. 2, 329 (hereafter cited as OR Navies). OR Navies, 326; Winfield M. Thompson, “A Confederate Raid”, in The Rudder, edited by Thomas Fleming Day, Volume 16, 1905, 246. OR Navies, 326; Thompson, 246-247. Charles L. Dufour, Nine Men in Gray (Lincoln: University of Nebraska Press, 1993), 147. Register of Officers of the Confederate States Navy 1861-1865 (Washington: Government Printing Press, 1931), 161. Members of Bosworth Post, Portland Soldiers and Sailors: A Brief Sketch of the Part they took in the War of the Rebellion (Portland: B. Thurston & Co, 1884), 33. This entry was posted in Arms & Armaments, Battlefields & Historic Places, Battles, Civil War Events, Leadership--Confederate, Leadership--Federal, Navies and tagged Boston, Caleb Cushing, Charles W. Read, Chesapeake, Forest City, Fort Preble, Fort Warren, George L. Andrews, Maine, Nathaniel Prime, Portland. Bookmark the permalink. Interesting and exciting story ! Thanks for posting. Thanks for commenting, David. I’m glad you enjoyed the posts. On Chebeague Island, in Casco Bay some ten miles from Portland, there is a grave of an “Unknown Soldier” that washed ashore some time after the Battle of Portland Harbor. Local legend has it that he was a confederate soldier from the Caleb Cushing. Could this be possible? Hi David, thanks for commenting. While a good story, I think it is exactly what you said, a local legend. When I was doing research on this series the only mention of any casualties I came across was one man, Jacob Gould, who was accidentally shot by someone being careless with a musket. 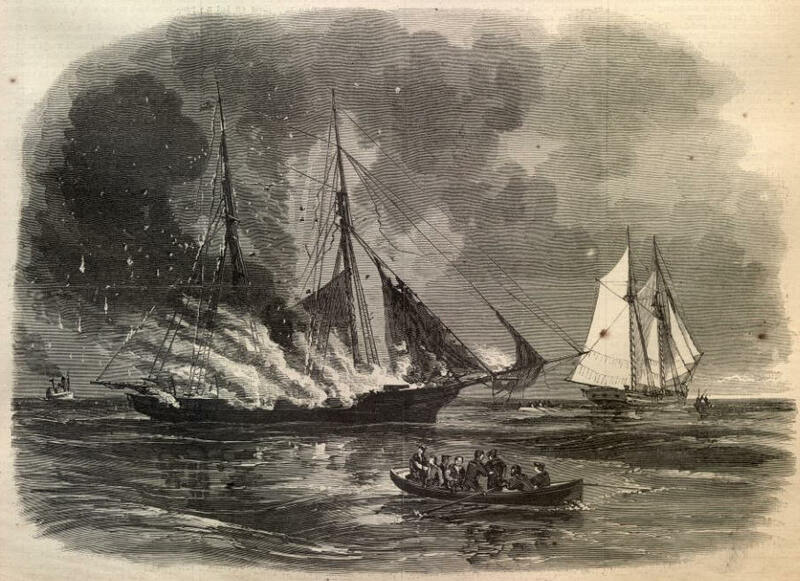 Before blowing up the “Caleb Cushing” Read got his crew off and surrendered to the Federals, so I don’t believe any Confederates were still on board when the ship exploded. Thanks again for commenting. Really enjoyed reading this…Jacob McLellan was my great, great grandfather and the story has been repeated in the family for as long as I can remember….Thank you! I’m glad you enjoyed the series and thanks so much for commenting.